Twones started life as a FriendFeed-type service that aggregated various music services into a single stream, which we dubbed a social music feed when we first caught wind of it. Problem was, the startup says, since users generally couldn’t play the music on their site and were constantly being directed to third-party websites and apps for streaming, people never really got that FriendFeed experience that would compel them to come back. The Dutch company figured they needed to do something else, and the result of their overhauled strategy will be going live in alpha mode this morning. 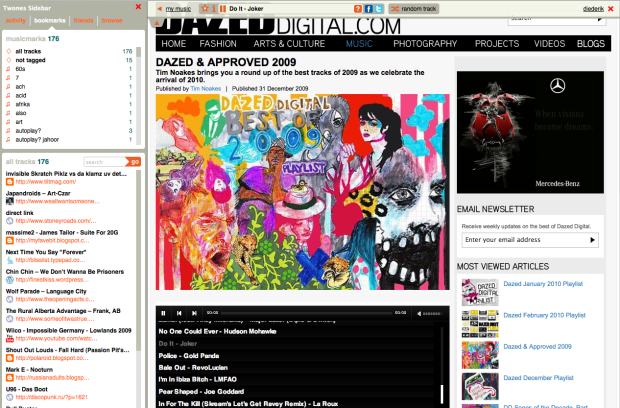 The short version: it’s Delicious-type bookmarking meets StumbleUpon -type discovery for online music. 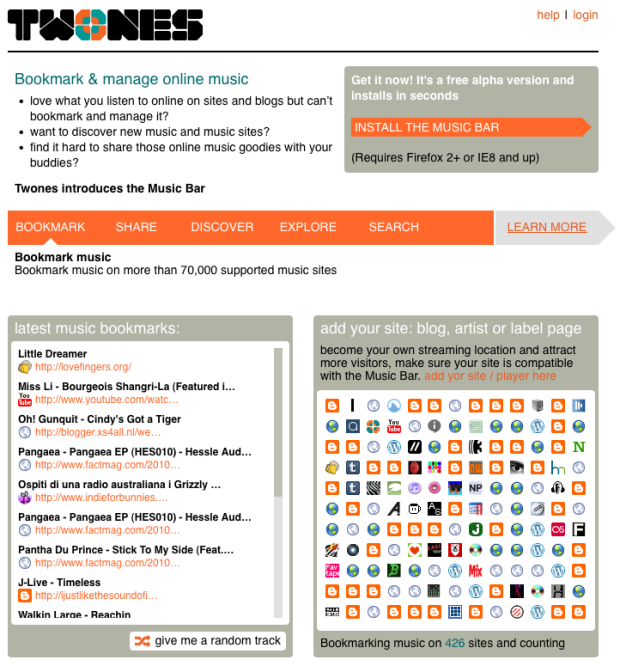 Essentially, Twones will now focus on what it refers to as the “Music Bar”, a browser add-on / bookmarklet that lets users bookmark music that is being streamed on other websites or MP3 blogs and discover music others have bookmarked in a fun way. The Music Bar will debut as a Firefox extension, but Chrome and Internet Explorer versions are near completion, I’m told. When installed, you can use Twones to bookmark music on thousands of supported websites, manage your virtual collection in a sidebar that looks a lot like Delicious, and share music with others in Twones or on services like Twitter and Facebook. In addition, any music you stream can be scrobbled to Last.fm so you can keep track of it there. Finally, there’s an ‘Explore’ button that basically lets people jump to any random track that is in Twones’ database – no need to install the Music Bar even for that. This can be a great way to discover new music, but arguably there is a need for some kind of controller that lets you explore tracks within a certain genre, at least. The problem with Twones is that, since it revolves almost entirely around music that’s being shared online elsewhere, you’re never quite sure if the songs you’re so carefully bookmarking are going to be there tomorrow, because the source could be gone for whatever reason. The startup says it’s working on ways to downsize that issue. Twones aims to make money from advertising, affiliate revenues, maybe a premium version down the line, and/or as an analytics service for online music sharing (kind of what Bit.ly does for general links today). They haven’t really figured out which path to take right now, but the startup says the $500k seed funding it raised earlier is enough to buy them time to do so, as they are very ‘cost efficient’ in the sense that there’s no need to store a gigantic amount of music on their servers, seal license deals or run a complex content distribution network. All in all, I could see myself using Twones for sure, but it feels more like a feature than a solid business to me. We’ll see if the next iterations of the service will make me change my mind.